The place name is rendered Àth Tharracail in Scottish Gaelic, and means "Tarracal's ford". The Gaelic place name is composed of two world elements: àth ("ford") and the personal name Tarracal. This personal name is cognate to the Scottish Gaelic Torcall and the English Torquil, which are derived from the Old Norse Þorketill. According to Moidart tradition noted in the 19th century, Torquil was the leader of a force of Norwegians who were pursued by Somerled, and made a final stand at the riverside below Acharacle Manse, where they were slain. Acharacle lies on the western end of Loch Shiel and its surrounding scenery make it a holiday destination for hill climbers and naturalists. It has, among other resources, a small primary school with around 60 pupils, a hotel (The Loch Shiel Hotel), a garage, a baker's shop, fish and chip shop, cafe and a grocery store/post office as well as a doctor's surgery. Acharacle is about 3 miles (4.8 km) from the Dorlin Beach, where the ruins of Castle Tioram lie. The population is about 300. 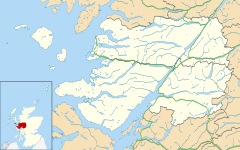 It is connected to the towns of Mallaig on the west coast and Fort William by a mixed dual and single track road to the villages north and by road south and east and then ferry at Ardgour to Fort William and Oban. It is one of the main centres for deer stalking on the Ardnamurchan peninsula. It supports salmon and trout fishing in Loch Shiel (subject to local fishing rights) and sea fishing from Loch Sunart which is nearby. Sheep farming and crofting are to be found locally and recently a new distillery has been built close to the village. Shiel Buses service public transport to both Mallaig and Fort William. ^ Acharacle, Ainmean-Àite na h-Alba, retrieved 16 May 2013 . ^ Hanks, Patrick; Hardcastle, Kate; Hodges, Flavia (2006), A dictionary of first names, Oxford Paperback Reference (2nd ed. ), Oxford University Press, pp. 263, 397, 410, ISBN 978-0-19-861060-1 . ^ Henderson, Angus (1916), "Ardnamurchan place-names", in Carmichael, E. C. (ed. ), The Celtic Review, 10, William Hodge and Company, pp. 149–168 .